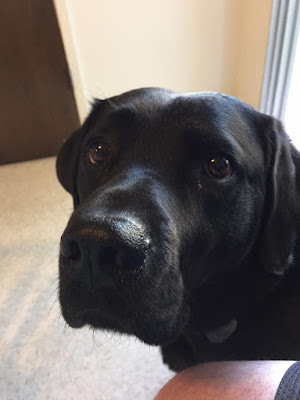 Last week saw me, my wife and Leif my guide dog on a weeks vacation at the coast. Friday had us in Moss Landing, CA. Moss Landing is a small place just south of Santa Cruz it lies on Highway 1, the Pacific Coast Highway. You might miss the town altogether if it were not for the giant electricity generating station beside the highway and a string of delicious fruit and vegetable stands. Our reason for visiting Moss Landing though was our required trip to Phil's Fish Market. Phil's is a fish restaurant, bar, retail store par excellance beside the small harbor in town. If you visit, I suggest that you ignore that Phil's looks like a steel shuttered warehouse and take a leaf from the suggestion that something great is going on inside the grey exterior. Outside you will be lucky to find a place in the small car park. In fact you might find the street jam packed with cars, trucks and motor cycles from all over the Western U.S. Believe me these people are probably inside Phil's and buying fishy meals by the platter. Anyway I am digressing from my theme today. Take it as honest, Phil's if you are on this part of the coast is somewhere you should eat. Back to my main theme: Sea Otters Crossing. Having crossed Highway 1, to enter Moss Landing, our car crossed a small bridge beside the harbor and my wife let out a squeal. There beside the road was a new roadsign. 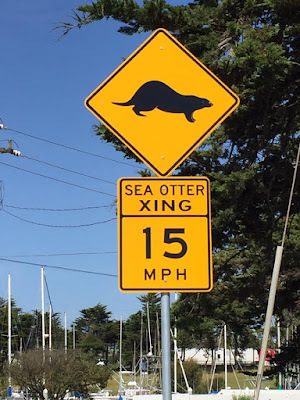 A bright Yellow warning Diamond shaped sign with the black silohuette of a sea otter. This together with a speed restriction of 15 miles per hour. The people of Moss Landing have created a crossing for Sea-Otters. These animals are as cute looking as can be. I have regularly seen them up and down the central coast, swimming and basking in quiet inlets and kelp beds. Once hunted for their soft fur, they almost became extinct, now they are spreading back into their once vast natural habitats. But this is the first time we have seen a real roadsign warning of their presence and good on you people of Moss Landing.